Young couples are among the many groups that recreational fishing is trying to attract. Lou Martinez isn’t giving up fishing from his kayak, but he realized last summer that kayak angling didn’t always afford him the experience he wanted. So in September, the Delaware Paddlesports fishing team member and You­Tuber bought a new 21-foot Skeeter ZX250 bass boat. He liked the standard features including the Minn Kota trolling motor and 250-hp Yamaha outboard. 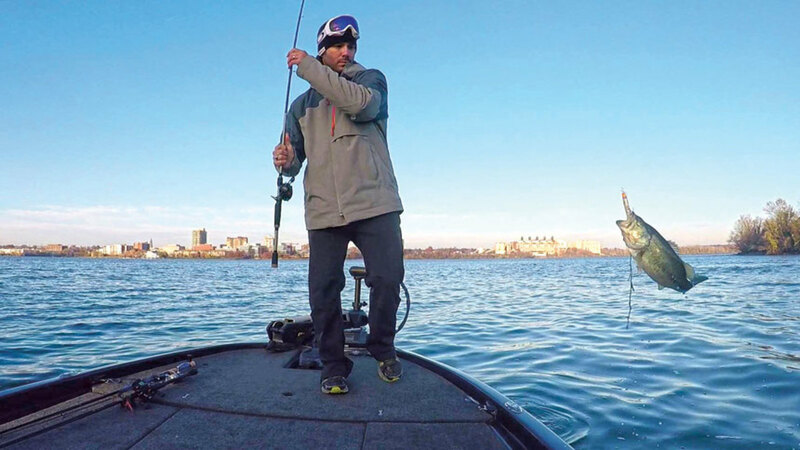 “First and foremost, I love kayaking, I love the experience of fishing from a kayak,” Martinez says in his video blog, BeyondTheBounds. 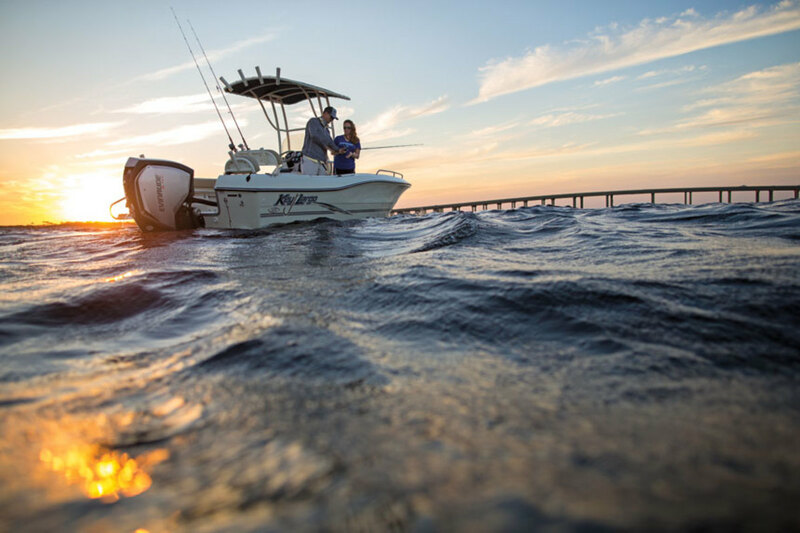 The symbiotic relationship between boating and fishing is indisputable: Almost half of people who fish, 48.7 percent, fish from a boat, and 83 percent of active anglers are also active boaters, according to a 2016 study by the National Marine Manufacturers Association, Discover Boating and the Recreational Boating and Fishing Foundation. Some, like Martinez, want to be more social than is possible with a kayak. Other anglers that want to grow their fishing expertise and venture offshore with a new boat. The industry’s growing awareness of people like him has led to boat and fishing equipment manufacturers launching angler recruitment and retention initiatives, and requests for legislative changes to federal saltwater fishing rules that they say overlook recreational anglers. Recreational boating and fishing groups have spent years gathering data on the economic impact of both sports. During the past year, several outdoor recreational industry associations formed the Outdoor Recreation Roundtable, representing RVs, motorcycles, snow sports industries, hunting and archery. And for 2016 — for the first time — the U.S. Department of Commerce’s Bureau of Economic Analysis recognized outdoor recreation’s contribution to the overall gross domestic product, and began measuring how outdoor pursuits ripple through the U.S. economy. Outdoor recreation contributed $673 billion to the economy, accounting for 2 percent of the overall GDP, the bureau found, making recreation a larger contributor than sectors including agriculture, mining, petroleum and coal, and computer and electronic products. The bureau also stated that outdoor recreation’s economic impact grew 3.8 percent, well above the overall U.S. economy’s 2.8 percent growth that year. The $673 billion, however, excludes some line items that are included in other sectors; guided tours and charters, for example, are categorized as travel. Industry data often show larger figures than the bureau’s is because some of those ancillary categories are added into industry numbers, while for GDP purposes the numbers must be compared as apples to apples. The bureau found that the boating and fishing category contributed $37 billion to the U.S. economy, making it the largest outdoor recreational activity after motorized vehicles, which accounted for $59.4 billion of gross output. The data also showed that boating and fishing nearly doubled the rate of outdoor recreational growth as a whole. The sector had one of the largest growth rates of outdoor recreation in 2016, just behind bicycling, generating $38.2 billion. It saw a 4 percent increase from the year prior, and a 5.4 percent growth rate from 2012 to 2016, says the bureau’s communication chief, Lucas Hitt. “It’s clearly one of the driving subsets of growth of outdoor recreational activities,” Hitt says. Angling enthusiast Lou Martinez lands a fish on his new Skeeter ZX250 bass boat. 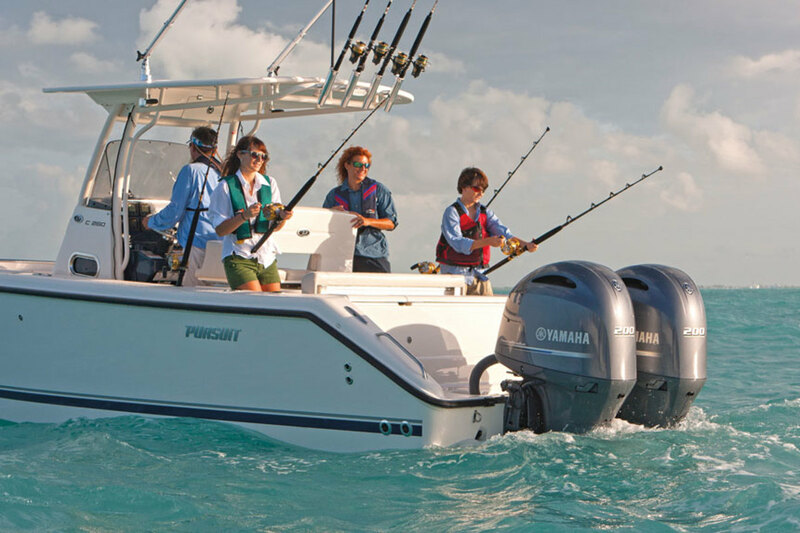 Even despite those figures, the Recreational Boating and Fishing Foundation — which has seen a nearly 20 percent rise in fishing participation during the past decade — still wants to grow the sport beyond its core demographic of white, male baby boomers. The foundation launched First Catch Centers as a pilot program in Texas and Pennsylvania this year to fish with children who might not otherwise try the activity. The RBFF and its sponsors are partnering with federal refuge centers to create permanent locations that will let whole families fish several times, so parents can learn with the children and gain confidence to fish on their own. This is a scene the marine industry wants to see more of — a family fishing together. Another large effort is targeting groups often underrepresented in the fishing community — Hispanics and women, among others. 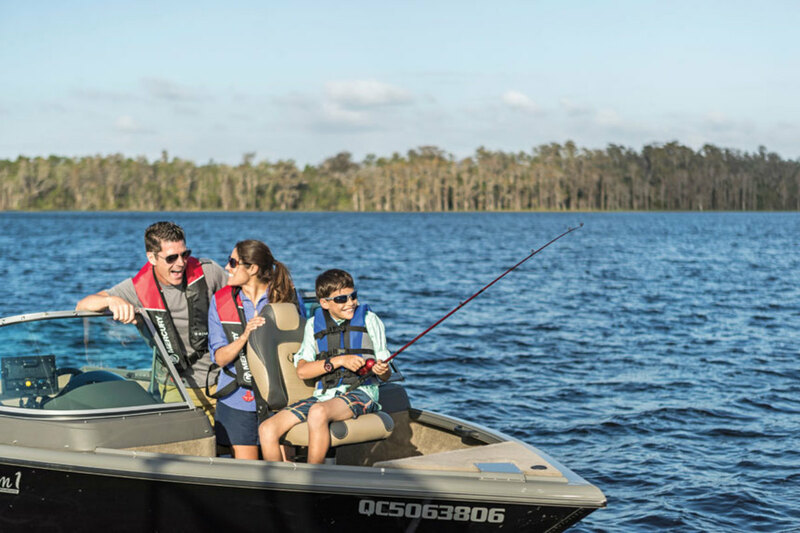 The RBFF has converted its Take Me Fishing campaign to focus on Latinos, calling the initiative Vamos a Pescar with guidance from Lopez Negrete Communications, a Houston-based marketing firm that developed a five-year outreach plan. The 59 million Hispanics in the United States have $1.7 trillion of spending power, and are the nation’s fastest-growing population, accounting for about 18 percent overall. More than half of the U.S. Hispanic population is younger than 29. Women helped drive an 8.2 percent spike in fishing participation during the past five years, and 45 percent of new fishing participants were female last year. Of those, 42 percent were 6 to 12 years old. “Moms are taking their sons and daughters fishing more than dads are,” Peterson says. RBFF president Frank Peterson is championing programs to draw women and Hispanic anglers. The RBFF is also homing in on California for recruitment. The RBFF is also hiring a coordinator to help state agencies recruit, retain and reactivate anglers in a program it calls “R3.” And along with several industry associations, the group is trying to get all states to collect more data on people who obtain fishing licenses, to learn how many are new, how many took time off before reactivating, and how many are return anglers. States such as Georgia saw a dramatic increase in retention of new anglers after stepping up communications with people who got fishing licenses. In 2015, the RBFF teamed up with the Georgia Department of Natural Resources’ wildlife division to pioneer an Angler Retention Pilot Program. The results showed that an email program generated a 4.7 percent increase in license renewal rate, or an additional 1,448 licenses sold. Based on the Georgia program’s success, the RBFF created a toolkit for all state agencies. Overall fishing participation grew to 47 million in 2017, helping the RBFF near its goal of “60 in 60” — having 60 million anglers in 60 months. During the past five years, participation was up 8.2 percent. The Sport Fishing Restoration and Boating Trust Fund reported that while hunting and shooting were down 35 percent during the final quarter of 2017, fishing and boating were up 5 percent. “October, November and December are not very strong fishing and boating months, so I’m very encouraged by the fact that all the different metrics out there on the health of our industries are showing upswings,” Peterson says. The RBFF has also tried to increase awareness that licensing fees are allocated to the environment and conservation. Studies have shown that children will continue fishing if their parents are anglers, too. Some regions face an uphill battle because of strict limitations on fishing seasons that sometimes drop allowable catch times to a few days. Florida fishermen and marine businesses have been impacted negatively by myriad state and federal regulations, says Ed Killer, who covers marine environment and industry for TC Palm, a USA Today-affiliated newspaper in southeast Florida. While government agencies focus on resource conservation, the same agencies often stifle the marine economy in coastal communities — even though major conservation grants allocated through the Sport Fish Restoration Boat and Trust Fund come from fishing license fees and taxes on sportfishing equipment, fishing tackle, yachts and pleasure craft, and gasoline, Killer says. Those who pay the fees sometimes say the government is overreaching. For instance, charter-boat operators say red snapper regulations in the South Atlantic are too restrictive, given the species’ abundance. The Magnuson-Stevens Act reauthorization in 2007, signed by then-President George W. Bush, layered on top of the red snapper harvest prohibition added a four-month seasonal closure on nine species of grouper including gag, red, black and scamp caught in waters between 60 and 160 feet deep. That closure runs January through April, the height of the coastal Florida tourist season. Whenever the recreational annual catch limit is met for any reef species such as black sea bass or triggerfish, anglers have even fewer species to fish for. 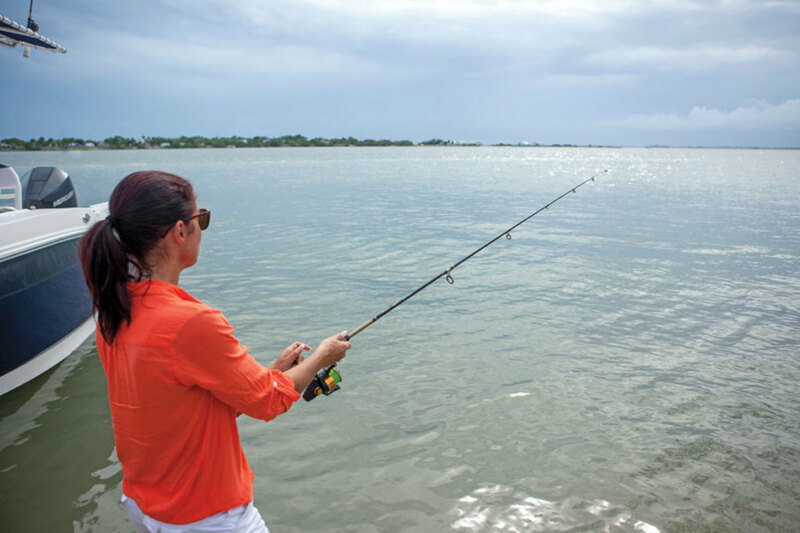 Women have driven an 8.2 percent spike in fishing participation during the past five years. The entire recreational marine business ecosystem relies on anglers to thrive, so all marine businesses should advocate for sound fishing policies, says Yamaha Marine president Ben Speciale, citing red snapper seasons in the Gulf region that have been as short as three days. Speciale says he doesn’t mind shortened seasons when sound data shows that fish stocks need to be rebuilt. But he and other advocates take issue with the fact that recreational anglers, who catch a few fish in a day, should be treated the same way as commercial anglers, who often use nets to catch hundreds of fish, potentially species they aren’t targeting, and whose catch is measured in pounds rather than by fish. The need for different rules has become apparent in the past decade, he says, because powerful motors, integrated technology, fishfinders and navigational equipment have increased recreational access to big offshore gamefishing, creating a vibrant offshore fishing industry. A reauthorization of the Magnuson-Stevens Act could begin to treat recreational and commercial anglers differently, and the Modern Fish Act, which is expected to move to the U.S. House and Senate floors this spring, would do that, says Mike Leonard, conservation director of the American Sportfishing Association. The Modern Fish Act takes several recommendations from the Morris-Deal Commission, named for co-chairs Johnny Morris, founder and CEO of Bass Pro Shops, and Scott Deal, president of Maverick Boat Group. That report, issued in 2014, made six recommendations for treating recreational fishermen differently. The fundamental challenge in current federal fisheries management law is that it was designed to manage large-scale industrial fisheries. The main issues addressed in the Modern Fish Act are allocation, exempted fishing permits and limited access privilege programs. “The stars are aligning this Congress to reform federal fisheries management in a way that will properly recognize recreational fishing under our nation’s primary marine fishing law,” says Center for Sportfishing Policy president Jeff Angers. Another part of the uphill battle to pushing through legislation that alters the MSA is the idea that recreational anglers aren’t concerned about fisheries. The Modern Fish Act has gained momentum not only with data about economic impact, but also as lawmakers realize its impact is felt across the country. Speciale, testifying at a Senate subcommittee hearing on the Magnuson-Stevens Act, talked about Georgia-based Yamaha’s five marine manufacturing facilities in the country. The American arm of the marine business employs more than 1,000 workers in the United States — many in states that don’t touch an ocean. Yamaha Precision Propellers Inc. produces more than 60,000 steel propellers a year at its Indianapolis plant that employs 130 people. Waxes come from Muskegon, Mich, and Cleveland. Stainless steel comes as ingots from Oil City, Penn., and Muskegon. Minerals used in the alloys are mined in places including Climax, Colo, a mining town about 950 miles from salt water. Nickel used in the alloy typically comes from Michigan’s upper peninsula. “Furthermore, once the propellers have left our Indianapolis plant, they go on to support small businesses in all 50 states through our boatbuilder and dealer networks,” Speciale says. Kilgore, Texas, home to Yamaha-owned Skeeter boat company, is far from the coastline, Speciale said. “With 281 employees, Skeeter is now the second-largest private employer in Kilgore, ranking just behind General Dynamics and just ahead of Halliburton,” Speciale said. 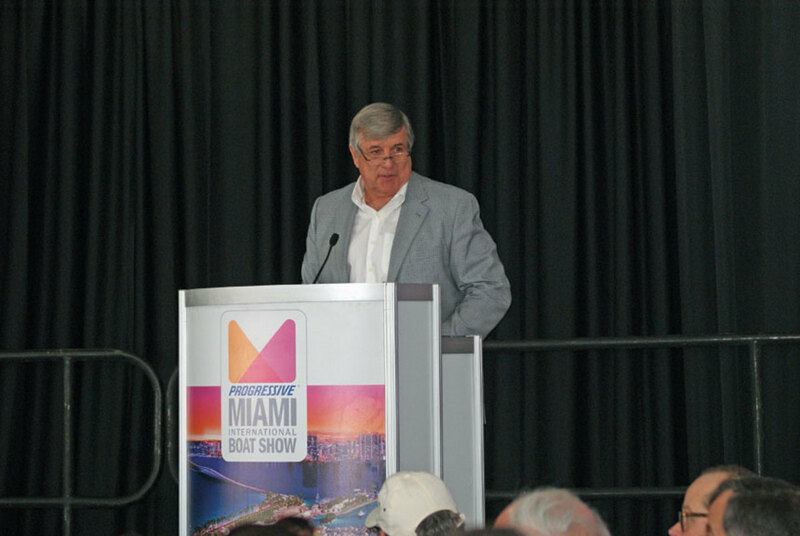 “The truth is that many of the raw materials and semi-finished products used for saltwater recreational fishing boat production come from factories, mines and suppliers in the interior of our great nation,” Speciale says.